Pretty melon or salmon pink color background with a profuse amount of pink & yellow roses. Selling the saucer only as the cup to this one has gone by the way. Perfect condition. Marlborough fine bone china made in England. 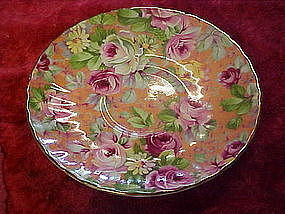 Lovely salmon pink or melon color background makes this an unusual but pretty chintz set. 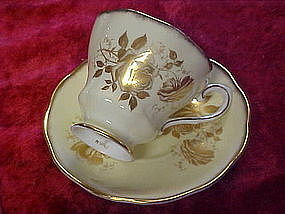 Lovely assorted colors of roses with a pretty gold accent trim on the cup and saucer. Full size set. Made of bone china in England. Perfect condition. I have a photo of the backstamp if you need to see it, Email me. 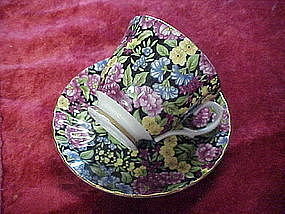 Pretty bone china cup and saucer set is made in England. Full size set with dainty scrolled handle. Perfect condition. 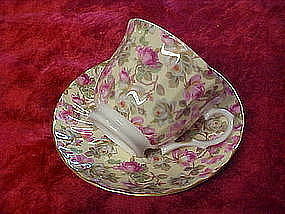 A lovely full size set bone china cup and matching saucer set by Royal Grafton England. Pretty pastel yellow background with lavish gold roses decoration and gold trim. Pristine condition. I have a pink set listed that is identical. 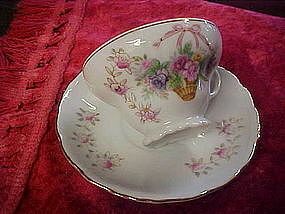 Pretty delicate china cup and saucer possibly by Lefton. dainty embossed scrollwork on the edges and has real gold trim. Flower basket design on the cup with pink rose embellishments. Matching rose embellishments on the saucer. perfect condition with no chips or cracks. I have 2 sets. Price is for 1 cup with matching saucer. 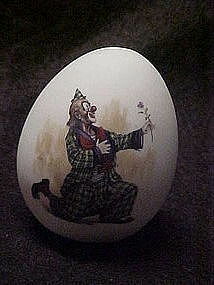 Heavy bisque porcelain egg with a clown down on bended knee and a flower in one hand. He looks to be professing his undying love. Felt on the bottom, and is perfect with no damages. Measures 2 1/2" tall. Nice! 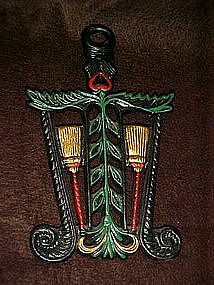 A wonderful vintage cast iron trivet with original painted accents and is in perfect condition. Heavy cast iron and has the number 254 on the back. It has brooms or tassels and a vine and heart. Sits on 4 little iron feet. Excellent condition. A wonderful asset to your trivet collection.Looks like a Wilton but is not marked so. Measures 4 3/4" by 7 1/2" . 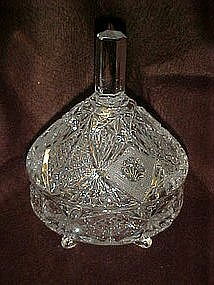 This lovely lead crystal covered candy dish sits on three curly-que legs. Measures 9" tall and is just perfect with no damages at all. Pretty pressed pattern with alternating cut, cross hatch pattern. This dish is heavy but so beautiful. 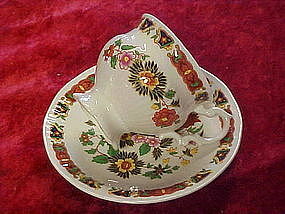 Cup and saucer with butterflies, Lefton? I belive this set is Lefton as it has numbers on the bottom that appears to be like their markings. Gold # 5443 on each piece. 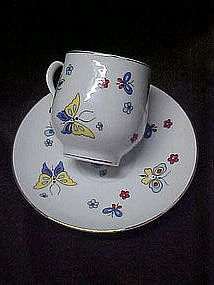 Full size set with pretty butterflies all over and has gold trim on the edges and cup handle. Pristine condition. 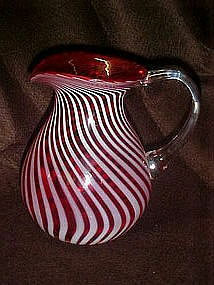 This mold blown pitcher is so pretty. Cranberry color with white milky swirls. Clear glass applied handle. Measures 7" tall an is in perfect condition. Mold blown, so no pontil on the botttom. Not sure of the maker or era, looks like Fenton but no marks or stickers. 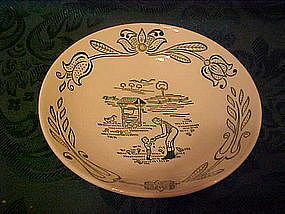 Wayne county pattern of a green farm pastoral scene of a man & boy, a well, and farmland, on a white background. These little bowls measure 5 5/8" in diameter and could be used for fruit or sauce. I have 9 available, and price is for each. Lugged (tab handled)dessert or bread and butter plates measure 6 1/2" plus the handles. 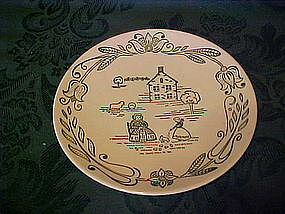 Same scene as the regular b/b plates with the lady churning butter, girl feeding chickens and the farm scene in green on a white background. I just have 3 and price is for each plate. All are in perfect condition. I have other pieces in this pattern in my catalog. 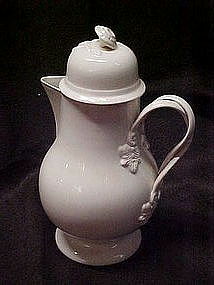 Wayne County pattern by Royal China. 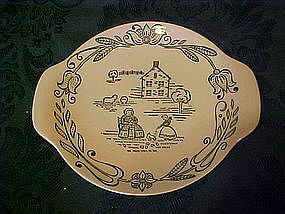 This is the 6 1/2" bread and butter or dessert plate. The farm scene in green depicts a lady churning butter, a girl feeding the chickens and a big farmhouse and pastoral scene. I have 4 available and price is for each. All are perfect. 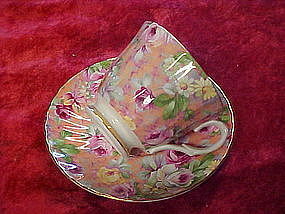 Wayne County pattern by Royal china. 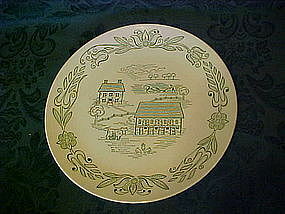 An Amish farm scenic pattern with a Dutch flair, in green on a white background. 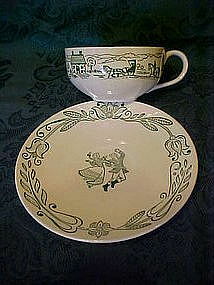 The saucers have a couple dancing and the cup has a farm scene, buggy and horse and the countryside. Price is for one cup with the matching saucer. I have 9 sets available and all are in perfect condition.